One late Saturday afternoon in August – seven years ago now – my friend Janet picked me up at the ferry terminal at Swartz Bay, near Victoria, and took me right to our friend Caitlin's parents' house. Now, I must tell you that Caitlin's parents live in my dream house. It's out in the country, a renovated wooden farmhouse set back from the road and surrounded by gardens and fields. Whenever I see it, it seems to have the late afternoon sun bathing it in golden light. At the time, I'd just moved away from Victoria to the big city of Vancouver, and was missing the Island. Janet pulled into the driveway, gravel crunching, and we got out. In the backyard, Caitlin had set up a little table covered with a pretty French tablecloth. We wandered inside and helped her bring out our dinner: salmon quiche and tarragon three-bean salad. We talked and ate and caught up as the sun fell lower in the sky. I wrote down the recipes for both the salad and the quiche. It's one of those golden memories that will always define Vancouver Island for me. The Island, it seems, always draws me back. Indeed, after a couple of years in Vancouver – just enough time to meet and marry my leading man – and then a year in snowy Ottawa – we moved back to Victoria three years ago. And now, we're leaving again. This time we're off to Edmonton, where Scott will start graduate studies. I've never lived on the Prairies before and I know it will be a shock: the flat horizon stretching as far as my eye can see, the cold winters, the flat Prairie buildings, the predominance of country music. But I know there will also be so much to explore: cross-country skiing, the year-round indoor farmers' market, Saskatoon berries, the predominance of perogies. 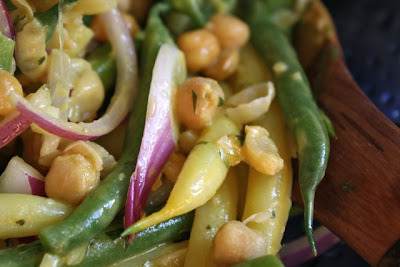 But this bean salad will always bring me back to the Island. I've made it in Vancouver, Ottawa, Victoria and – soon – I will make it in Edmonton. The mustard dressing is light and the tarragon brings out the fresh beans' flavour, while the chickpeas give it a buttery background. 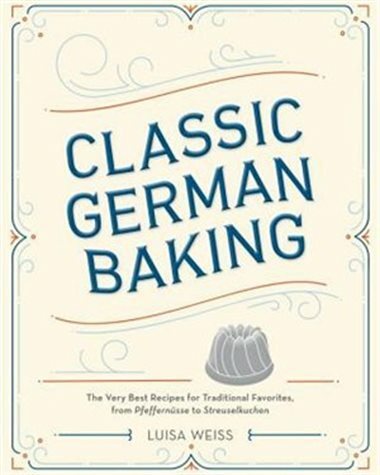 It is, in short, the perfect thing to make on a late August afternoon. If you can, eat it outside. A note about the recipe: Caitlin says she found this in a magazine and cut it out. This many years later, she can't remember which magazine it was. She first made it for us in August 2005, which means it must have been published before that. Do you recognize it? If you remember the magazine, could you let me know? I always want to give credit where credit is due. 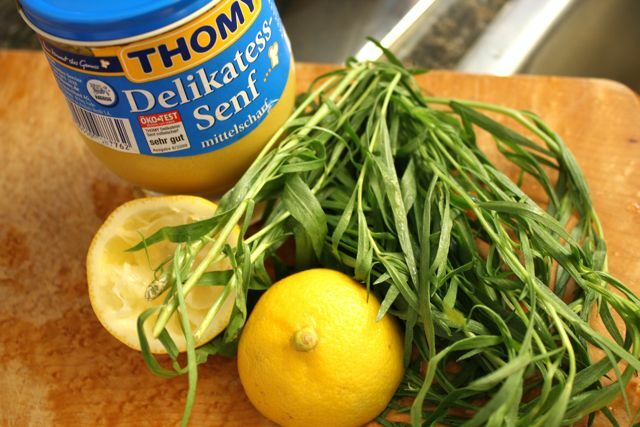 In a small bowl, whisk the mustard, lemon juice, olive oil, garlic and salt together to make a dressing. Whisk in the tarragon. Set aside. 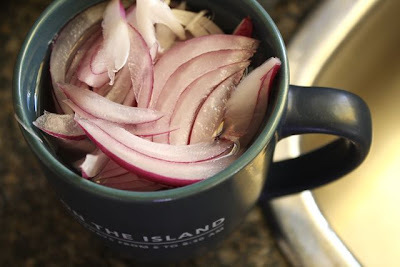 Once the onion is cut up, put it into a mug and top it with cold water. Let it sit to mellow while you make the rest of the salad. Bring a large pot of lightly salted water to a boil. 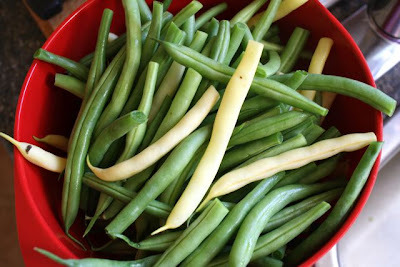 Drop the green and wax beans in. Cook them, uncovered, until tender-crisp, about 5 minutes. Drain the beans in a colander and rinse with cold water to stop the cooking. Drain the onions of their water. Mix the beans, onions and chickpeas together. Toss with the dressing. Eat! 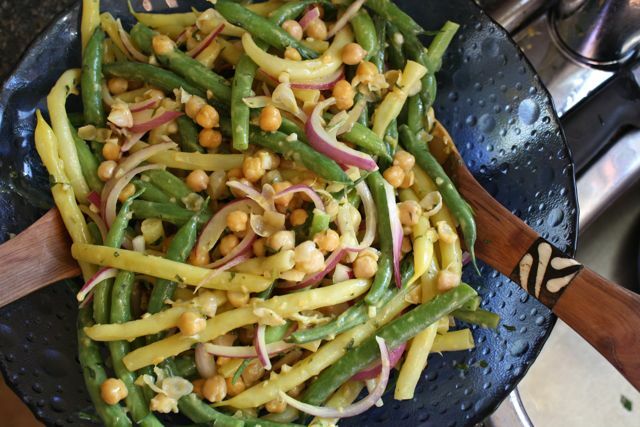 This salad sounds perfect for summer--tangy & filling & easy! Love it. 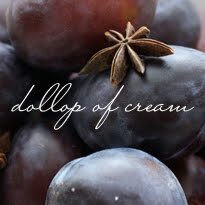 I'm not sure I've commented on your blog before, but I love it. Happy travels and good luck with the new city. 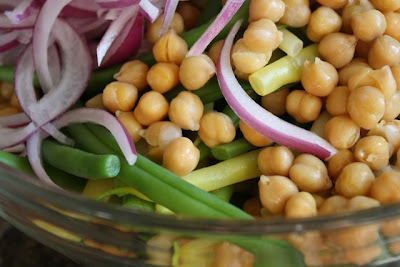 As for this salad, I'll be making it soon.